Elisabetta Gardelli thought she'd spend her days serving coffee and writing obits for the town paper. But then an unexpected opportunity results in her dream job as a real journalist for the News Journal. Now, divorced and determined to make it on her own, Lissa is assigned to write a series of interviews about entrepreneurs who’ve made their mark at an impressively young age. First up? Wall Street mogul Trevor Dane - Lissa's first love. Lissa hasn't seen Trevor since he left the small town of Serendipity to earn his spot on the right side of the tracks. Ten years have passed but neither has really moved from their super-passionate teenage affair - or the heartbreak that followed. This reunion can be their second chance or it can provide much needed closure. It all depends on Trevor. Can he forgive Lissa or will the past continue to stand in their way? Please let there be more of these little novellas to come for this wonderful town of Serendipity. There are so many wonderful stories to tell in this little town and if they are all as good as this one and the first book, then we NEED them all! 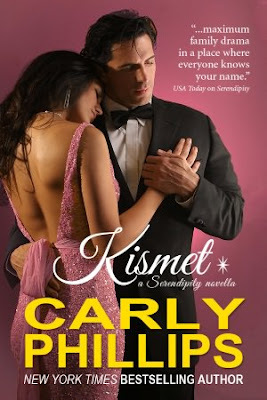 Kismet features the story of Trevor and Lissa. They were high school sweethearts from the wrong side of the tracks, but completely in love. Trevor didn't have the confidence in that love though and decided that they needed to take a break. Lissa, heartbroken and dejected, drank too much and made a single horrible decision that ended up with her pregnant and in an awful marriage. Neither of them ever recovered from those events or the abrupt ending to any possibility of a future for them. So when Lissa is assigned to interview Trevor for her job ten years later, things heat up between them quite quickly. I love a good angsty love story and this one was PERFECT! So much heartbreak between these two...for both of them. They both made horrible decisions and paid an awful price for that. But what is VERY obvious is that neither of them ever got over their feelings for the other. Now it's just a matter of if they can move PAST what happened to them in the past so that they can have a future. I really loved Lissa's character. I wasn't a huge fan of her's in Serendipity (no huge surprise there...she wasn't a very nice person), but I just loved her in this. Suddenly all of her actions make so much more sense. One single bad decision on her part which probably only covered a two hour span of her life, ruined her entire future. How can you not feel badly for her especially knowing how much she regrets what happened. She's made the best out of her circumstances and hasn't wallowed which is so admirable, because she has a LOT that she could wallow about. I love how willing Trevor is to accept that he made some serious mistakes and assumptions about Lissa. He's matured so much over the ten year span and after his initial reaction, begins to realize his mistakes. He's a great character. And this was quite simply a great novella. I truly loved it!